An easy run at lunchtime today fitted in between my holiday club (which has been averaging 50kids a day!) and a meeting to discuss Rugby in my schools next term. I’m enjoying just going out for a run every other day at the moment. My legs are feeling better by the day. They are a lot less ‘heavy’ than this time last week. I’ve decided I can manage to do another parkrun on Saturday. Our flight isn’t until 12.45pm and the first leg is a domestic flight to Heathrow so we don’t need to book in until 11.30am. So parkrun at 9.30am, home by 10.30am, shower, change and blog (!!?!) by 11am, leave house at 11am and arrive at airport 11.30am – sorted! Plus Marco (and Debs?) is (are) also running so it will be good to see him (them). We are really looking forward to our trip to Thailand on Saturday. We lived in Bangladesh and India for 8years from 1987-1995 but have not been back to Asia since then so we are excited! 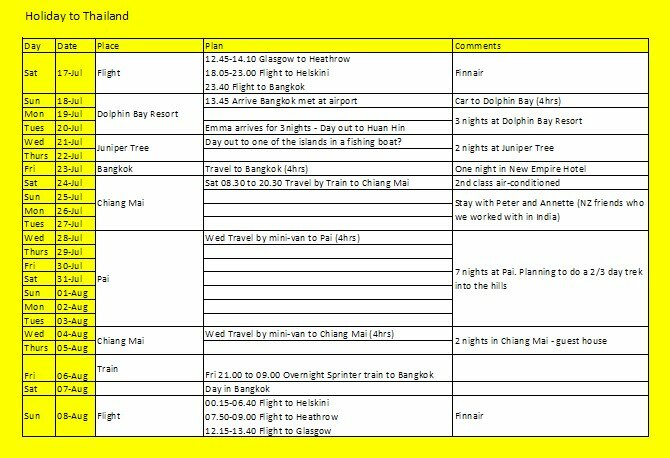 For anyone interested here is our itinerary ….. If you thought you’d have a three week break from this blog think again! I’ll be taking my netbook and hope to record any running I do plus some photos and observations along the way but will be dependant on getting some free/cheap wifi. I had an email from Motionbox yesterday saying they are ceasing to operate. I’ve used motion box to post my videos. They have been taken over by snapfish but I tried uploading a video and I’m not impressed so far. Anyone recommend a good web site they use to upload videos? U-tube has a limited (10mins) size which isn’t much good as mine are normally longer than that! I noticed Iain uses Vimeo so I’m giving that one a trial as well! This entry was posted in Easy run, Holiday. Bookmark the permalink. I won't be running on Saturday, as I'm helping at start of Clyde Stride and then supporting Sharon. Vimeo has been just fine for me. You may just need to consider if you can live within the 500Mb per week upload limit on the free account. But more importantly…. congratulations to you and Katrina on your anniversary! Hope you both have a great holiday. I can understand why you are excited. Have a wonderful time. I'm thinking about starting some video uploads myself. I haven't thought about who and what to use yet. FWIW, I've found that Vimeo videos often stream poorly, stopping frequently as what you're watching catches up with what's buffered and necessitating leaving them to download before watching from cache. OTH, YouTube videos rarely seem to suffer from this problem.